Successfully Added Orimag P6 Mini DLP Projector - 1080p Support, 80 ANSI Lumen, Aluminum Body, 120-Inch Image Size, 2000mAh, SD Card Slot (Silver) to your Shopping Cart. The Orimag P6 is a lightweight mini DLP projector that can be carried around easily anywhere you go. 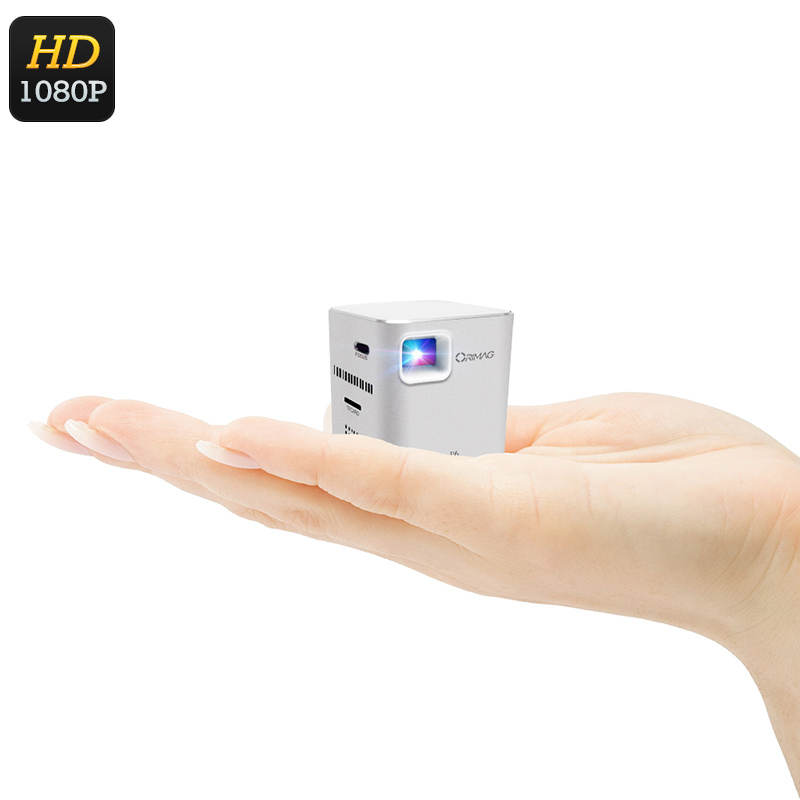 This mini DLP projector features a premium aluminum body which gives it a high-end look. It is great for businessmen who often find themselves on the road for giving presentations. With its 1080p support and 480p native resolution, this mini projector sets forth crisp visuals in any semi-dark room. It is capable of producing up to 80 ANSI-lumens and lets you enjoy a large image with a size up to 120-inches. With its 0.3 to 3.5, throw distance, this mini projector is great to be used in small and medium-sized rooms and offices. This compact mini projector features built-in speakers. It furthermore comes with a 3.5mm Audio jack that lets you enjoy films and series without disturbing others. You’ll be able to use this projector with your iOS, Windows, or Android device. Additionally, you can insert media via a 32GB SD card. Thanks to its 2000mah battery, this mini DLP projector can be used for up to 1.5 hours without the need for an external power supply. This makes your gizmo great for enjoying a movie or for giving presentations during upcoming business trips. The Orimag P6 Mini Projector comes with a 12 months warranty, brought to you by the leader in electronic devices as well as wholesale electronic gadgets..